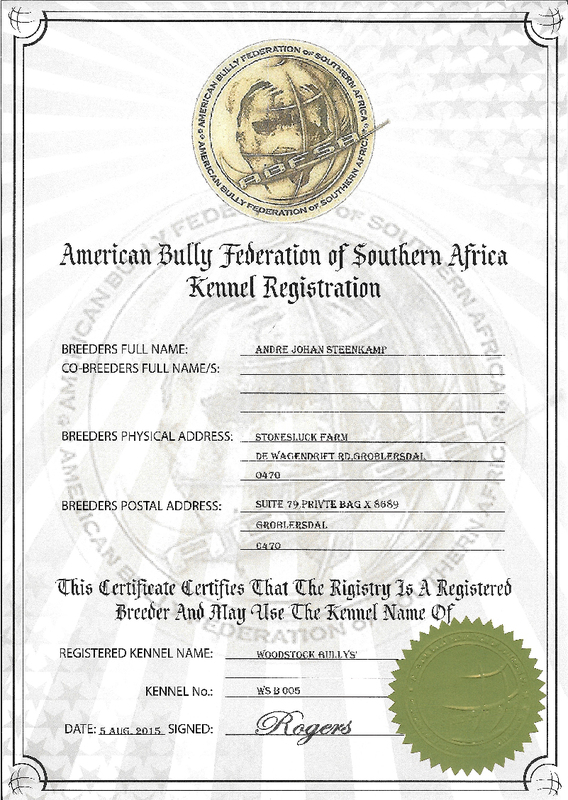 WoodStock Bullies is owned by father and son, André Steenkamp and Justin Steenkamp. André, not really being a serious dog lover, tolerated the dogs in his house owned by his wife Kwassie and his children. He never had the desire to own a dog, until one day a work colleague showed him a picture of the American Bully CashPot. André could not take his mind off owning an American Bully, but Kwassie felt that it was a lot of money to spend on someone who is not a devoted dog lover. Her sentiment was correct as André never expressed the desire to own a dog, until he was introduced to the American Bully. After various break-ins at their Ramsgate Holiday home André suggested to Kwassie that maybe it was time to get a dog. And guess what? Kwassie said: “Well why don’t you get one of those American Bullies that you like so much”. André jumped at the opportunity and immediately started looking for a puppy online. After spending a few days looking for the puppy he wanted so badly André finally found just what he was looking for. André then decided to involve his son Justin with the purchase of the puppy, considering Justin’s love for dogs and his knowledge of a similar breed “American Pitbull”. André and his son Justin discussed wither to purchase the puppy on not. Justin, unaware of the American Bully Breed tried to convince his father to rather get a Pitbull but shortly after seeing this breed The American Bully Justin agreed with his father and that they should get a American Bully Puppy. Within day’s father and son purchased a male American Bully puppy which they named Dozer. After they got puppy Dozer, André told his son that they should consider breeding with the puppy they had purchased and Justin agreed. André expressed his desire to the breeder of the puppy that he would like to join their kennel club and maybe even become a breeder. There was no stopping the father and son team now, and within a week, they were the owners of three American Bully pups. Within days of buying the pups, André found out that joining the kennel club was just a matter of completing paperwork, but registering as a breeder, was almost impossible. He felt that the kennel club he was intending to join was now less eager to welcome him as a breeder. André is of the opinion that the initial willingness to welcome him as a potential breeder was now a thing of the past and he felt like the kennel club wanted to protect the elite few, who were already breeders. The work colleague, who initially showed him the picture of CashPot, put André in touch with Steven Rogers, who is also a breeder of American Bullies. Looking for more dogs to purchase, André and Justin visited Steven and Ronel Rogers at their Sundra home. As the day progressed, the topic of conversation just being American Bullies, André found out that Ronel was a founder of the American Bully Federation of Southern Africa. (ABFSA) André expressed his frustration in the lack of assistance and willingness to get him registered as a breeder with the kennel club he initially intended to join. The ABFSA welcomed André with open arms and have given him all the assistance needed to register as a breeder. With the contacts that Steven and Ronel have in the Bully world, André was soon introduced to international breeders in Germany, Belgium and the USA. Within a matter of a month André, in partnership with Steven, imported Bullies from Germany, Belgium and the USA. André intends to bring the best American Bully bloodlines to South Africa and working closely with the ABFSA and its members. There is no stopping André and his partners now. And the strangest of all? André loves his Bullies so much, not one was taken to Ramsgate as a watchdog. He opted for an electric fence, CCTV cameras and proximity beams. Long live WoodStock Bullies and the ABFSA!